Amplification and encoding of restrictions sites (BglII and EcoRI) onto the ends of the DNA templates performed by PCR amplification. Digestion of the amplified DNA with BglII and EcoRI followed by purification. A plasmid based on the pET28c plasmid was digested with BglII and EcoRI and purified on a 1% 0.5× TBE agarose gel. The linearized pET28c plasmid was extracted from gel using GFX gel extraction kit and the insert was ligated into the plasmid. The ligation reaction mixture was used directly to transform the plasmid into DH5-alpha E. coli using standard heat-shock procedure. The transformed bacteria were plated onto LB-agar with Kanamycin and cultured. To produce RNA origami by in vivo production. To genetically modify E. coli cells that are able to produce RNA origami structures which correctly bind with thrombin. In order to implement large scale production of RNA molecules, in vivo production is a promising approach. Biotechnologists have demonstrated the use of cells as molecular factories for producing many valuable compounds (small molecules, proteins and RNA) that have been used in wide ranging applications. Large scale production of small molecules such as artemisinic acid (antimalarial drug precursors), which was expensive and difficult to produce by total chemical synthesis approach, was successfully produced by in vivo production, Figure 1 A (1-2). RNA is a functional biomolecule and plays important roles in protein synthesis and cellular regulation. With the current technology, chemical synthesis of RNA is limited in length (max.~120 nt due to synthesis technology limitations) and by high cost. In vivo production of double-stranded RNA has been demonstrated, Figure 1B (3). Jepsen and colleagues have successfully demonstrated the production of a long and functional RNA origami by using E.coli cells (4). Due to its potential, we attempted large scale production of RNA origami by in vivo methods (Figure 2). Figure 2 illustration of RNA origami production by in vivo expression. We inserted DNA into a plasmid vector by compatible restriction digestion followed by ligation (Figure 3). The cloning can be divided into three parts: (i) PCR amplification DNA template, (ii) digestion DNA template and vector with restriction enzymes, and (iii) ligation. 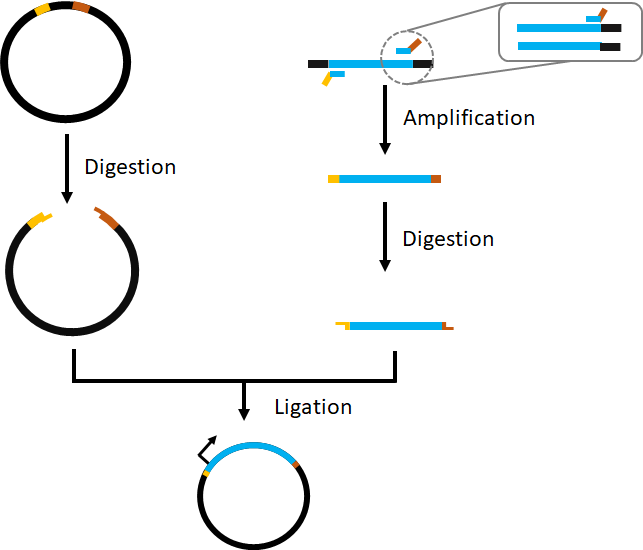 Figure 3 Illustration of cloning within a plasmid vector by digestion and ligation. The DNA (G-block) was first amplified using PCR for supply production. Details of the PCR setup, reaction mixtures, and DNA primer can be found in the materials and methods section. Figure 4 shows a 1% agarose gel with a clear band of the correct size the DNA sequence of 285 base pairs. Each amplification typically produced around 1.5 µg after purification was performed. The forward and reverse DNA primers contained restriction cut sites for EcoRI and BgIII. Next, we performed digestion of DNA template and plasmid with BgIII and EcoRI restriction enzymes, followed by ligation of our DNA insert into the plasmid. The plasmid maps with and without inserted DNA template are illustrated in Figure 5. Figure 4 Amplification of G-block using e-primers over a temperature gradient for annealing, 44 - 63.4°C. To verify the the plasmid (produced by Michael Nguyen, Ph.D. student from Aarhus University) contained the correct DNA insert, the plasmid was incubated with restriction enzymes, BgIII and EcoRI. Figure 6 shows that once the plasmid was digested, the desired insert was separated from the plasmid as shown by the faint band. The size of insert piece agreed with the size of control (lane 2). 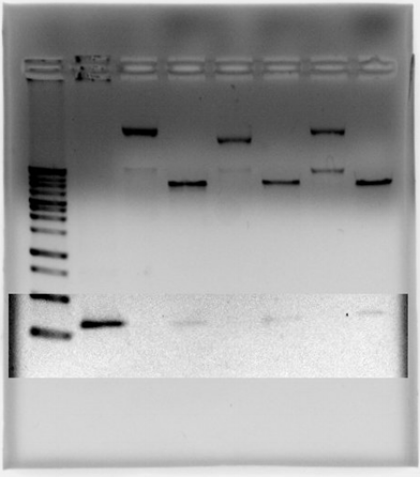 Figure 6 1% agarose gel used to test insert after plasmid digest. The faint bands show the insert (after contrast editing). 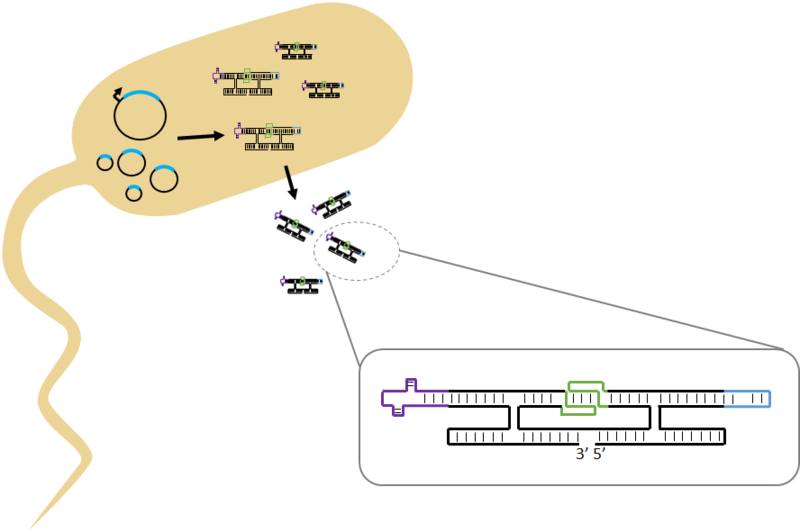 Figure 7 depicts our transformation of competent E. coli cells with the DNA template inserted into plasmid achieved by standard heat shock procedure. The plasmid contains a Kanamycin resistance gene. The E. coli cells containing the plasmid are able to grow in selective media as shown in Figure 7B. Six single colonies were selected and cultivate in broth media. Only three colonies were successfully grown in selective broth was shown in sectors 1, 5, and 6 (Figure 7C). Figure 7 Transformation of plasmid into competent E.coli cells. (A) The competent cells with plasmid are able to grow colonies on selective media that contains antibiotic. (B) Single colony selection (1-6) from first plate incubation. (C) Growth of colonies selected from previous plate. The sections marked with an “x” did not show growth in liquid media in test tubes and were not used further. In this project, we aimed to produce genetically modified cells to produce our thrombin-binding RNA origami structures. We successfully produced plasmid DNA with our insert piece for RNA origami production. The inserted plasmid was transformed into host cells, E. Coli. We hope that the transformant E. coli cells will produce RNA origami. In the future, we will perform magnetic bead extraction to isolate our RNA origami structures, and test their activity. Taking advantage of cells’ ability to produce RNA will allow us to mass produce our novel thrombin-binding RNA origami structures. The RNA origami produced in vivo will be extracted from cells. For purification of RNA origami from cell extract, we will use magnetic bead separation using single stranded RNA (ssRNA) extension at the 5’end of the RNA origami. The sequence of the extended ssRNA will be complementary with ssDNA extended on magnetic bead. To recover RNA origami from the bead, remover strand (ssDNA is fully complementary with ssDNA on bead) will be introduced and RNA origami will be removed from the beads by strand displacement reaction. Figure 8 Purification of RNA origami from in vivo production by using magnetic bead and strand displacement interaction. Magnetic beads are represented by grey half-circle. Remover strand, ssDNA, depicted as orange lines. Amplification of the DNA origami template was performed using primers which contained the restriction sites for BgIII and EcoRI (named e-primer). Reaction buffer, forward and reverse e-primers, dNTP, DNA polymerase and nuclease-free water were added to a PCR tube in the concentrations shown in Table 1. DNA Polymerase was added last and the sample was pipetted to mix. Table 1: Concentration for Amplification of G-block DNA template with BgIII and EcoRI restriction sites containing primers. Figure 9 Thermocycler setup for gradient annealing of G-block amplification. Following PCR, a small volume of the amplified DNA sample (~2-5 µl) was used for testing in an 1% agarose gel. The DNA was run beside a 1 kb ladder (Promega) at 150V for 30 minutes. The gel was then viewed under UV light (ProteinSimple instrument). If the proper band size was observed, the remaining DNA sample was then used for in-solution purification using the GFX DNA Purification Kit (GE Healthcare). 1 µl of the purified solution was used for concentration analysis using the Nanodrop 3000c spectrophotometer (ThermoFisher Scientific). After mixing, the solution was heated at 37 °C for 30 minutes. The digested plasmid solution was loaded into a 1% agarose gel at 150 V for 30 minutes. The gel was viewed under UV light and the digested plasmid band was cut out using a razor blade. To purify, the Quantum Prep Freeze ‘N Squeeze DNA Gel Extraction Spin Column Kit from Bio-Rad was used with the accompanying protocol. After mixing, the solution was heated at 37 °C for 30 minutes. A small volume of the amplified DNA sample (~2-5 µl) was used for testing in an 1% agarose gel and the remaining solution was purified using GFX DNA purification kit. The solution was incubated at room temperature for 5 minutes, followed by incubation at 16 °C overnight. The plasmids sent from Aarhus University were used for transformation into DH5-alpha competent cells. A 1:4 ratio of plasmid to DH5-alpha cells were added to an eppendorf and incubated on ice for 30 minutes. The eppendorf was removed from ice and placed into 42 °C water for 45 seconds, and immediately back on ice for 2 minutes. 250 µl of S.O.C. was added to the cell mixture. The solution was mixed at 220 rpm at 37 °C for 1 hour. The solution was then plated onto LB-agar plates with Kanamycin. 50 µl of S.O.C was used for a control, 200 µl of solution was used on the first plate, and the rest of the solution was loaded onto a second plate (labeled rest). The plates were allowed to dry, and incubated at 37 °C overnight. The following day, 3 ml of 2xYT media was distributed into six test tubes and labeled. A new plate was divided into 6 sections and labeled with the six tubes. Six single colonies were chosen from the plates. Each colony was taken and streaked onto its own section using a pipette tip. Each tip was then dropped into its corresponding test tube. The plate was allowed to dry and incubate at 37 °C overnight, while the tubes were shook at 220 rpm at 37 °C overnight. A single colony was taken from each of the plate sections which had growth in both the test tubes and section plates. The single colonies were streaked on their own new plates, which were incubated at 37 °C overnight, and were cultured in a test tube with 3 ml of 2xYT medium by shaking at 220 rpm at 37 °C overnight. The following day, optical density measurements of the test tube medium were taken using Nanodrop 3000c. The plates which contained individual colonies were stored at -80 °C for cryostock. Ro, D. K., Paradise, E. M., Ouellet, M., Fisher, K. J., Newman, K. L., Ndungu, J. M., Ho, K. A., Eachus, R. A., Ham, T. S., Kirby, J., Chang, M. C., Withers, S. T., Shiba, Y., Sarpong, R., and Keasling, J. D., Production of the antimalarial drug precursor artemisinic acid in engineered yeast, Nature 2006, 440, 940-3.